FREE WORLDWIDE INTERNATIONAL REGISTERED AIRMAIL. 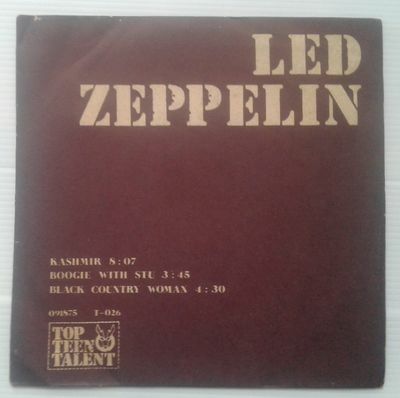 Artist: Led Zeppelin Album: Kashmir / Boogie With Soul / Black Country Woman (label misprint - tracks reverse sides) Format: 7" (45RPM) Label: Top Teen Talent Catalog Number: T-026 Pressing: Thailand Condition: Record VG+ / Sleeve VG+. Vinyl has only a few hairlines and a couple sleeve scuffs. There is one mark that cause a click (4 rotations) towards the end of 'Boogie With Stu'. Labels are nice and vinyl is glossy. Vinyl is a low-end VG+. Original picture sleeve has light shelf wear to the seams/spine/opening, very light staining to the white areas (shelf wear), very light damage to the upper left-hand corner (see photo), and a one lightly dinged corner. Sleeve is a low-end VG+. PLEASE READ OUR DETAILED RECORD/COVER GRADING DESCRIPTIONS AND SHIPPING/TRANSIT TIME DETAILS BELOW. All records are visually graded unless noted in description. Some records may play better or worse than visual appearance. When asked, we do are best to grade records per their audio performance, but realize that some collectors with high end set ups may have a different listening experience from ours. We will do whatever we can to be as accurate in our performance grading as our equipment allows us to. M (MINT) Perfection, no flaws, defects, marks or otherwise indications of being handled or played. Any scuffs, hairline scratches or other marks disqualify discs from this category. We do not use this grade unless the record is unopened, as even the act of inserting the disc or removing it from the paper sleeve may cause scuff marks on the vinyl. NM (NEAR MINT) This is highest grade that we will assign to opened, handled records. The vinyl is virtually flawless, bright and shiny. A very minor, barely visible scuff or two may be permitted, but no scratches. The disc should play with no audible noise. The label is bright, clean and unmarked. EX (EXCELLENT) Disc plays near perfectly, but may have minor paper scuffs that do not interfere with the sound quality. There can possibly be a hairline scratch or two but nothing that is obvious or affects play. Vinyl is bright and shiny; label is clean and unmarked. VG+ (VERY GOOD PLUS) Some visible surface wear, very minor scratches and scuffs, but minimal impact on the sound quality. Vinyl will still have good luster; labels may have minor imperfections (small labels or initials, etc.) but otherwise clean. VG (VERY GOOD) Vinyl will have noticeable scratches or scuffs that cause minor surface noise, but do not overpower the music. There will be no skips. Vinyl may appear somewhat dull and grayish. Labels may have small tears, tape marks, larger writing, etc. but still easily legible. There may be wear or deformation of the spindle hole. G (GOOD) Well-played, dull, grayish vinyl with deeper scratches and wear causing distracting surface noise (hisses, pops, and clicks). The record will still play through without any skips. Labels may be significantly defaced or damaged. _____________________________________________________________________________________ M (MINT) Absolutely perfect; no corner dings, marks, tears, dents, impressions from the disc, or other flaws. Cover should appear as if a record has never been inside. NM (NEAR MINT) Very minor signs of wear or cover impressions. Artwork is as close to perfection as possible. EX (EXCELLENT) Minor disc impression or slight corner creases, no wrinkles, puckers, seam splits or writing on the cover. Artwork is clean and unworn and there is no ink wear. VG+ (VERY GOOD PLUS) Cover is clean but may have minor writing or marks and may show slight wear. There may be just the start of ring wear, where the disc has created a raised area on the cover that resulted in the ink wearing off the paper. There may be slight discoloration or staining, minor seam wear, but no splits or tears. Corners may have small creases or fraying. VG (VERY GOOD) Covers are worn and used. Seams may be starting to split or may have been unobtrusively repaired with clear tape. (I use special archival-quality, non-yellowing, clear tape for all repairs.) There is moderate ring wear, but the artwork is still attractive. There may be yellowing or discoloration and there may be larger writing, labels, or marks. Corners may have damage or creases and there may be scratches or gouges that otherwise damage the artwork. Every package is sent via international registered airmail and includes a tracking number. For all orders over $100.00 USD, foreign or domestic, we require your shipping information on eBay to match your confirmed shipping information on PayPal. All records are packaged in brand new standard cardboard mailers with cardboard inserts/padding. All orders will ship within 72 hours. If you have any special shipping requests, please let us know upon paying for your order and we will do our best to accommodate you.